This is how Julie’s Granny served champ, with a great big lump of Irish butter in the middle! Put the potatoes (unpeeled) in a pot and cover with cold water and a good pinch of salt. Bring to the boil, then simmer until completely tender (usually about 20 minutes but keep checking and don’t let them go to mush). Heat the milk with the scallions for about 5 minutes. Drain the potatoes and peel while still hot. If you have a potato ricer you could use that but we tend to use a standard masher. Beat the butter into the mashed potato with a wooden spoon, then stir in the warm milk and scallions. Season well with salt and white pepper. Serve the potatoes in a warm bowl. Make a dip in the middle with the back of a spoon and add a lump of good quality (preferably Irish) salted butter. Our mate Brett got us this genuine Kassler, a pork loin expertly cured and lightly smoked by Ed Hicks in Dun Laoghaire. If you can’t find Kassler use a smoked bacon loin or rack and prepare yourself for the best bacon & cabbage ever. Wine Suggestion: We chose a classic white Burgundy, 100% Chardonnay made in oak from a winemaker in Meursault, Patrick Javillier. He makes a couple of Bourgogne Blanc’s from a couple of very particular sites in Meursault and boy are they good. This time we chose his Cuvée Oligocene which is a vineyard partly in Meursault and partly in the ordinary Burgundy classification (despite it being the same soils and aspect). This makes this wine a bargain and we love it. Pre-heat the oven to 200C/400F/Gas 6. Put the potatoes into a large saucepan, cover with cold salted water, bring to the boil and simmer for 5 minutes, then drain. Par-boil the cabbage in another large pan of lightly salted water for 2 minutes. Drain into a colander and refresh with cold water, then use your hands to squeeze out the excess water. Put the bacon into a large roasting tray and place in the oven. Roast for 10 minutes before adding the butter. When the butter has melted, add the potatoes and roast together for 20 minutes, turning the bacon & potatoes in the butter now and then. Now push the potatoes and bacon to one side and add the cabbage. Season the potatoes and cabbage with salt and roast for another 10 minutes, turning everything in the smoky butter. Meanwhile, make the sauce by melting the butter in a small pan and adding the flour. Cook for 2 minutes, stirring occasionally, then take off the heat and whisk in the chicken stock until smooth. Place back on the heat and simmer for 20 minutes, stirring occasionally. After 40 minutes in total remove the bacon from the oven and check that the potatoes and cabbage are cooked. Transfer the vegetables to a warm serving platter, then slice the bacon and arrange on top. Keep warm. To finish the sauce, de-glaze the juices in the roasting tin with the Maderia or Port and add to the sauce. Whisk in the mustard and season to taste with salt and pepper. Our local butcher, Brady’s, stocks excellent free-range chickens which are juicier and have more flavour than most super-market offerings. Being a very cheap meat overall we think it is worth spending a bit more as the benefits far outweigh the cost difference. We never tire of roast chicken recipes as they’re usually straight forward and provide lots of leftovers. We challenge you to resist the skin on this one! Wine Suggestion: we felt like a red so went for the Chateau de Beauregard Fleurie as it has a lighter body and a lower acidity than a Pinot Noir which matched this dish really well. The chicken was moist, but not fatty so the medium acidity was a perfect foil and neither wine nor food overwhelmed the other. Mix all of the marinade ingredients together and season with some salt and pepper. Put the chicken into a large roasting tray and rub the marinade all over the skin with your hands. Put the squeezed lemon halves inside the cavity and roast for 1 hour 30 minutes, then rest for 20 minutes under some foil before carving. 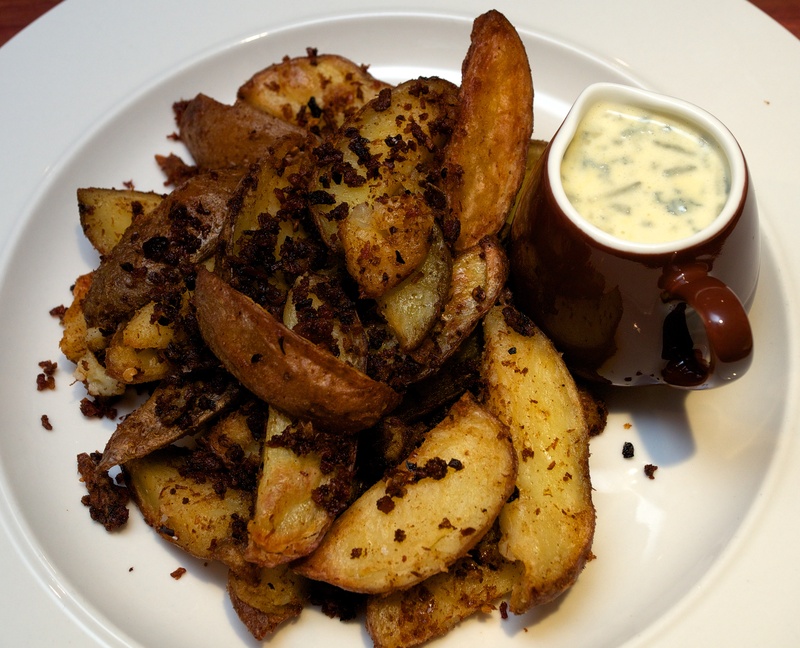 Cut the potatoes in half and toss with the cumin seeds, chilli flakes, 2 tbsp olive oil and plenty of salt and pepper. Tip into a shallow roasting tray and put in the oven above the chicken for the last 20 minutes. Turn over once during cooking and continue to cook for a further 20 minutes while the chicken is resting. Delicious served with some coleslaw on the side. Everyone loves mash in our house especially with lots of cream and butter added. Chives from the garden are also a popular addition. Cover the potatoes with cold water and a good pinch of salt and bring to the boil. Cook for 15-20 minutes or until tender, then drain in a colander and return to the warm pan to dry. Gently heat the cream in a small saucepan, then add the butter and pour over the potatoes. Season with salt and freshly ground white pepper. Add the chives and beat with a wooden spoon until fluffy. How to make friends and influence people – serve them roast beef! We love it rare. Wine Suggestion: a classic dish requires a classic match; good red Bordeaux. Specifically we love left-bank Bordeaux from a good vintage which has all the power but is never heavy; we don’t want to overwhelm the beef as it should be the star. 2009 and 2010 are surprisingly drinking very well and show how good they are but we’ve found the 2005’s are only just opening up. Interestingly we prefer more youthful vintages with this dish and think that the joy of primary fruit with just a little development makes a better match. For this meal we dug into the cellar and pulled out a Chateau Chasse-Spleen 2005 which was still quite tight and structured but the load of tannin in the wine worked perfectly with the proteins in the beef. Preheat the oven to 220ºC/Fan 200ºC/Gas 7. Make a bed with the rosemary and bay leaves in the bottom of a large roasting tin. Smear the beef with mustard, salt and pepper and set on top of the bed of herbs. Make sure the herbs are well tucked in to prevent them burning. Put the shallots and potatoes around the beef. Drizzle olive oil over the potatoes and shallots and toss with your hands to coat. Roast the beef in the oven for 20 minutes, then turn down to 190ºC/Fan 170ºC/Gas 5. Cook for a further 20-25 minutes, then remove from the oven and rest for 10 minutes while keeping the potatoes & shallots warm. This is a great Friday or week-night dish which you can easily eat on it’s own, preferably in front of the TV! Cook the potatoes in plenty of salted boiling water for about 15 minutes or until almost tender. Drain the potatoes and put them in a bowl. Add the shallots and toss with the cayenne, chilli flakes, garlic, cumin and turmeric. Add the salt and oil, then tip into a roasting tin and bake for about 30 minutes or until crisp. Wash the spinach leaves and put into a pan over a moderate heat, cover with a lid and leave for a couple of minutes to wilt. 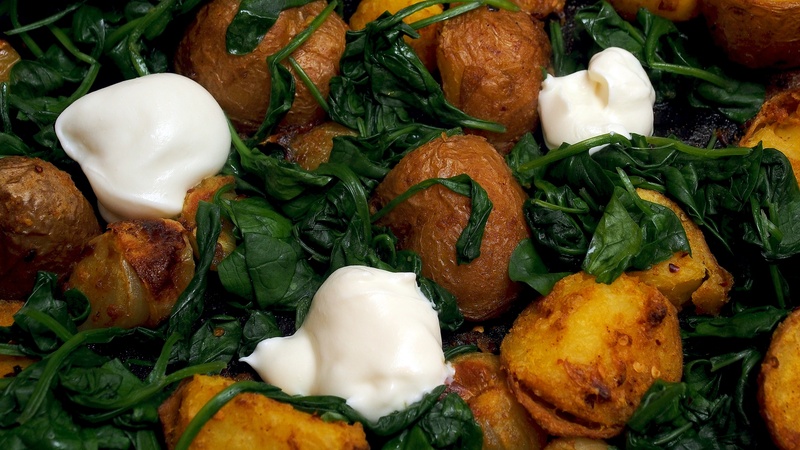 Toss the spinach with the potatoes and garnish with a little yoghurt and coriander. These are very delicious and perfect to share out of a big bowl in front of the TV on a Friday night – or at least that’s what we did. The bacony crumbs are a revelation! We expected the bacon to be problematic and to dry out in the oven but not in the slightest, the cooking just seems to intensify the flavours a bit and the “crumb” texture spreads through the dish perfectly. Scrub the potatoes and leave the skins on. Cut them in half lengthways, then into chunky wedges. Cook in boiling salted water for 15 minutes or until getting close to tender. Drain and tip into a roasting tin. Fry the streaky bacon in a little oil until very crisp or barbecue them like we did. Put the cooked bacon into a food processor with the chilli flakes, groundnut oil and smoked paprika and whizz until it looks like very fine crumbs. Tip the crumbs over the wedges and toss gently to coat. Bake for about an hour or until crispy and sizzling. Warm 250ml double cream in a small non-stick pan, add the Gorgonzola and stir gently until melted. Trickle the warm sauce over the wedges to serve or serve on the side as dip.